Gotham Apartments, located in Kansas City, Missouri is a 103-unit community for families. Originally constructed as early as 1919 and listed on the Kansas City Register of Historic Places, Gotham Apartments haven’t been updated since 1981. The need for rehab had become dire, both cosmetically and architecturally. Keeping interior and exterior historical elements help to maintain the history of the building and charm of the neighborhood. Hamilton Builders, LLC has updated each kitchen, bathroom, plumbing, electrical, paint, flooring, and HVAC. Gotham Apartments is in the 3rd Council District of Kansas City. The project is a scattered site that lies to the North of East Linwood Boulevard and is one the of the “great boulevards” of the city. It was at once, considered one of the most elegant boulevards in the city. Since its inception, Linwood Boulevard has been a high-density residential corridor. This historic redevelopment of the Gotham Apartments is a series of six apartment buildings linked together as a result of a rehabilitation project in 1981. The first building was constructed in 1919. It is a four-story brick building, containing 45 efficiency and one-bedroom apartments, plus an office for the property manager. The next building is a two-story brick and frame building constructed in 1925 and contains 10 one-bedroom apartments. 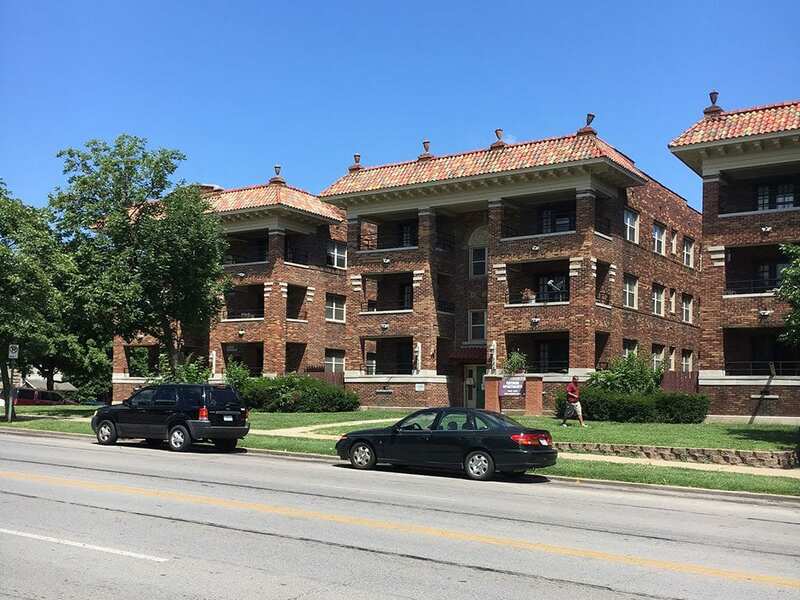 Four identical one-bedroom apartment buildings were constructed at 3200-18 E. Linwood Boulevard in 1925 of reinforced concrete and brick and remain intact as one of Kansas City’s best examples of three-story pier-over-pier colonnaded apartment buildings. In addition to the unit rehab’s, we will also add meeting space for community gatherings and enrichment services to be provided at the property. All units are funded by a Project-Based Section 8 contract that expires in 2025. The property is currently being registered with the State Historic Preservation Office and the National Park Service. Gotham Apartments is currently listed on the Kansas City Register of Historic Places.